Hi I’m Dr David Stapleton. Welcome to our website. As you can see I’ve been around for a while. 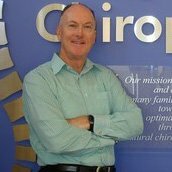 In fact I’ve been a Chiropractor for well over 40 years and the great thing is that I’m just as passionate about what I do now, as the day I started. Apart from the required qualifications to register as a Chiropractor, I have a Graduate Diploma of Musculoskeletal Management and a Master’s Degree in Applied Science. I’ve also been involved in PhD related clinical trials studying ‘low back pain during pregnancy’ and consequently published some of my work. I also have a particularly special interest in cycling, sports injuries and sports performance. A bit diverse I know, but I love it. We are very much a ‘family’ practice, and have looked after squillions of mums, dads and their kids over the years to the point that time has gone by where the kids have grown up and I’m now looking after their kids as well. We must be having fun because time has absolutely flown. I invite you to have a good look around our site and hope that you not only learn something about the science and art of Chiropractic, but also about what we do and how it could seriously help you.